A lead detective in the murder of Jarvin Blake has urged people to come forward if they saw a car and a group of people shortly before the fatal attack. Mr Blake, a dad to three small children from Gleadless, was chased down Catherine Street before being knifed to death at the junction of Brackley Street in Burngreave at around 3.20pm on Thursday. The 22-year-old sadly died and Mr Blake's friend is in hospital with stab wounds in a 'serious but stable'. Detective Chief Inspector Steve Handley is particularly keen to hear from anyone who saw a car in close to the scene at around 3pm on Thursday. A group of people are said to have got out of the car, shortly before the 22-year-old was stabbed. There is no information on the type of car or the number of people at this time. Police believe the attack was targeted. Officers remain in the area, carrying out enquiries and there will be an increased police presence going into the weekend as detectives work to determine the exact circumstances surrounding the incident. 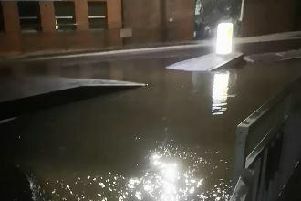 DCI Handley said: “Shortly after 3pm yesterday, we know that a car pulled up on Catherine Street, at the junction with Brackley Street, with a number of people getting out. “Shortly after, we believe Mr Blake and his friend were the victims of a targeted attack, with Mr Blake suffering fatal stab wounds. “No arrests have yet been made and I’d like to ask members of the public, who may have seen what happened, or who may know who is responsible to please come forward. “Mr Blake, from Gleadless, leaves behind a family, including three young children, who will now have to grow up without a father. I’d ask anyone who has information to bear this in mind, and the impact this will forever have on Mr Blake’s family. “We have a dedicated team of detectives working on this investigation, in addition to officers and staff from across the county. The high visibility presence you’ve seen in the area since yesterday afternoon will continue and if you have any information or concerns, please do speak to officers who are in the area." If you saw what happened, saw the car on the road and a group of people get out, or have any information you think you could help with enquiries you can contact the major incident room directly on 01709 443528. You can also call 101 or Crimestoppers anonymously on 0800 555111.